KIEV, Ukraine -- Ukrainian opposition leaders on Friday denounced a deal allowing Russia to keep its navy in Ukraine for another quarter of a century, saying it amounted to ceding control over the nation's territory. Ukraine's President Viktor Yanukovych answers question during a press-conference in Kiev. Yanukovych on Thursday defended a deal to allow a Russian base to stay in Ukraine until 2042 after it was slammed by his opponents as a surrender of national sovereignty. The agreement is the first concrete sign that newly-elected President Viktor Yanukovych will steer Ukraine back into Russia's orbit, reversing his pro-Western predecessor's attempts to decrease Moscow's influence. In return, Moscow gave the ex-Soviet republic steep discounts for the Russian natural gas on which its industries depend. Wednesday's deal signed by Yanukovych and Russian President Dmitry Medvedev allows Russia to extend its lease of the Black Sea Port of Sevastopol for another 25 years after the current lease agreement expires in 2017. Former President Viktor Yushchenko, who now leads opposition party Our Ukraine, said the deal amounted to Russia's "military occupation." The agreement is set to come up for ratification next Tuesday in both Russia and Ukraine. Former Prime Minister Yulia Tymoshenko, who leads the biggest opposition faction in parliament, urged lawmakers to vote against the deal. She said Friday that the agreement is a "strategic mistake" that would mean that "Ukraine has lost control over its territory." But the opposition faces an uphill battle in trying to block the ratification in parliament, which is controlled by Yanukovych's party and its allies. The opposition denounced the deal as illegal, saying that the constitution does not allow foreign troops to stay in Ukraine. But supporters of the agreement point at another section of the constitution that allows them to stay temporarily with parliament's approval. Yushchenko pledged to join efforts with Tymoshenko, his fierce political rival, to block the ratification, but even he predicted that the majority coalition in parliament will have its way. 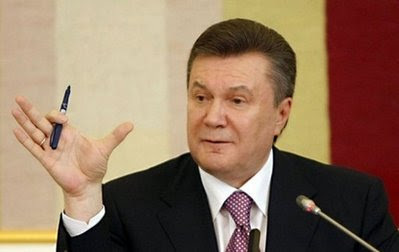 Some opposition lawmakers in the federal parliament and regional legislatures talked about launching impeachment proceedings against Yanukovych. "Yanukovych's actions should be treated as a state treason, and an impeachment procedure should be launched in parliament," said Borys Tarasyuk, former foreign minister in Tymoshenko's government, who currently chairs a parliamentary committee on the European integration. Analysts said the pact will trigger a deeper split in Ukrainian society between the Russian-speaking east and south and the western regions where nationalist sentiments run strong. "The first evident consequence is a significant rise of temperature in Ukrainian politics," said political analyst Igor Zhdanov.